A friend asked me recently, of all the healing techniques I have ever studied or mastered, what I thought is the most powerful. Anything that makes major shifts in dogs and babies, you know that is doing something, as neither animals nor infants are consciously aware that you are putting anything in their water. The powerful effects go way beyond placebo. One of my clients brought her year-old baby to me recently. He was suffering from a bad case of eczema. Using kinesiology, I identified which foods she was eating were causing him to have skin problems, since she is still breast feeding and all the baby food she makes for him is 100 percent organic. I also gave her a single flower essence made from orchids called Unicorn. I hesitate even to say the name because which flower essence someone else would need for a skin problem would more than likely be totally different, as each of us has very specific emotions and having a full palette of flower essences from all over the world to me is like an artist having every color under the sun to treat virtually any emotional disturbance. My client told me that her baby’s skin problems started to clear within 24 hours. “The more Unicorn I gave him, the better his skin would get,” she told me. 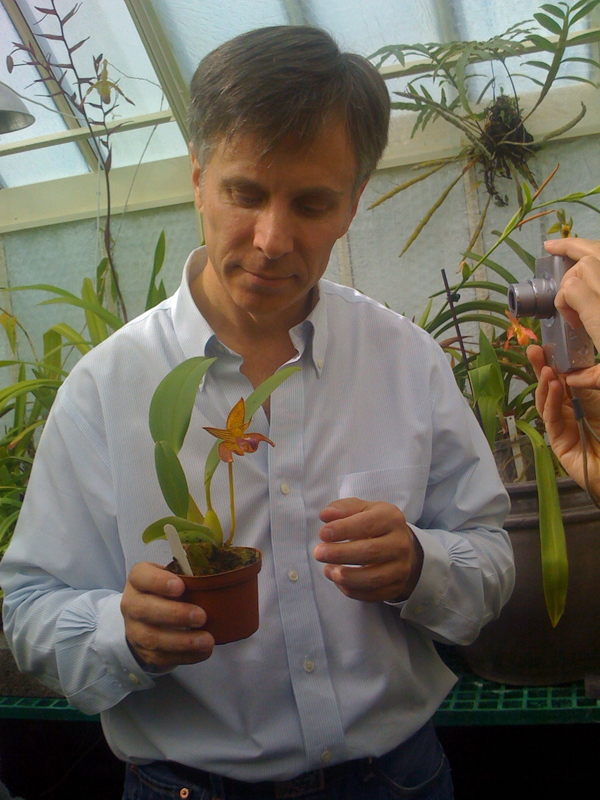 This is a photo of Don Dennis, creator of www.healingorchids.com. I took this photo in his orchid house in September 2009. Don told me of all the photos anyone has taken of him and his orchids, this was his favorite. He is quite the photographer himself – just visit his website and all you can say is “WOW!” His love for his subjects is palpable. Bach flowers, which are perhaps the most well-known but not the ones I use most frequently. Bach flowers were created in the 1920s. I use more current vibration essences because the energy on the planet has definitely made major shifts since the 1920s.